Enjoy rich, full sound from music or movies with this compact pair of sleek Bose speakers. Whether placed on a desk or bookshelf or mounted on a wall for use as surround speakers, these speakers are designed to deliver balanced, spacious sound with minimal or moderate amplifier power (10 to 100 watts per channel). Automatic protection circuitry keeps the speaker drivers from being overdriven, heightening the speakers’ reliability without interfering with your listening. Bose 161 speakers in black If you’ll be using them in a home-theater capacity, keep in mind that they’re designed to blend seamlessly with the Bose VCS-10 center-channel speaker and any Direct/Reflecting Bose speaker system. Unlike conventional speakers, which radiate sound in a single direction, these speakers use Articulated Array driver positioning and Stereo Everywhere technology to deliver balanced sound throughout your listening area. Further, Bose’s two 2.5-inch proprietary Twiddler drivers per speaker move more air from their small enclosures than similarly sized conventional drivers, creating a sound you’d expect from much larger speakers. Be sure to use the proper gauge (or thickness) of wire or speaker cable for the length required to run the distance between your amplifier and your speakers. If the length is 30 feet, use a minimum of 18 gauge (.75 mm), use 16 gauge (1.5 mm) for 45 feet or 14 gauge (2 mm) for 70 feet. Supplied custom mounting brackets offer a range of placement options. What’s in the Box – Left speaker, right speaker, mounting brackets, self-adhesive rubber feet, user’s manual. 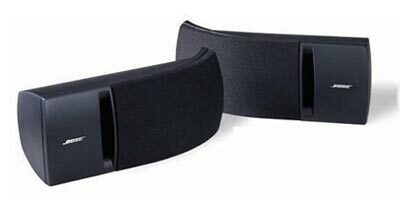 Enjoy rich, full sound from music or movies with this compact pair of sleek Bose speakers. Whether placed on a desk or bookshelf or mounted on a wall for use as surround speakers, these speakers are designed to deliver balanced, spacious sound with minimal or moderate amplifier power (10 to 100 watts per channel). Automatic protection circuitry keeps the speaker drivers from being overdriven, heightening the speakers’ reliability without interfering with your listening. 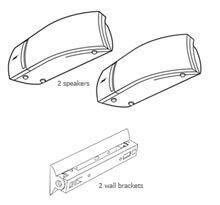 If you’ll be using them in a home-theater capacity, keep in mind that they’re designed to blend seamlessly with the Bose VCS-10 center-channel speaker and any Direct/Reflecting Bose speaker system. Unlike conventional speakers, which radiate sound in a single direction, these speakers use Articulated Array driver positioning and Stereo Everywhere technology to deliver balanced sound throughout your listening area. Further, Bose’s two 2.5-inch proprietary Twiddler drivers per speaker move more air from their small enclosures than similarly sized conventional drivers, creating a sound you’d expect from much larger speakers. Be sure to use the proper gauge (or thickness) of wire or speaker cable for the length required to run the distance between your amplifier and your speakers. If the length is 30 feet, use a minimum of 18 gauge (.75 mm); use 16 gauge (1.5 mm) for 45 feet or 14 gauge (2 mm) for 70 feet. Supplied custom mounting brackets offer a range of placement options. Left speaker, right speaker, mounting brackets, self-adhesive rubber feet, user’s manual.